Announcement Regarding An Amendment to Our Acceptable Use Policy It's no secret we've been evaluating a specific monthly data usage or bandwidth threshold for our Comcast High-Speed Internet residential customers for some time. Rumors circulated online last year and they popped up again in May. In January, we added new frequently asked questions about what we consider acceptable use of our service to our online Help site www.comcast.net/help and Security Channel page www.comcast.net/security. We've listened to feedback from our customers who asked that we provide a specific threshold for data usage and this would help them understand the amount of usage that would qualify as excessive. Today, we're announcing that beginning on October 1, 2008, we will amend our Acceptable Use Policy (AUP) available at http://www.comcast.net/terms/use/ and establish a specific monthly data usage threshold of 250 GB/month per account for all residential customers. 250 GB/month is an extremely large amount of data, much more than a typical residential customer uses on a monthly basis. Currently, the median monthly data usage by our residential customers is approximately 2 - 3 GB. To put 250 GB of monthly usage in perspective, a customer would have to do any one of the following: * Send 50 million emails (at 0.05 KB/email) * Download 62,500 songs (at 4 MB/song) * Download 125 standard-definition movies (at 2 GB/movie) * Upload 25,000 hi-resolution digital photos (at 10 MB/photo) This is the same system we have in place today. The only difference is that we will now provide a limit by which a customer may be contacted. As part of our pre-existing policy, we will continue to contact the top users of our high-speed Internet service and ask them to curb their usage. If a customer uses more than 250 GB and is one of the top users of our service, he or she may be contacted by Comcast to notify them of excessive use. At that time, we'll tell them exactly how much data per month they had used. We know from experience the vast majority of customers we ask to curb usage do so voluntarily. As stated above the new monthly data usage threshold will officially take effect starting October 1st. We are notifying customers in a number of ways. For example, we have posted a preview of the amended AUP as a PDF on this page. We are also running banner notices on our Comcast.net home page and on our Security Channel Web page to alert customers about this upcoming change. In addition, we have provided a number of FAQs that are available at http://help.comcast.net/content/faq/Frequently-Asked-Questions-about-Excessive-Use. Finally, we will also notify our customers directly by including an insert (also called a bill stuffer) in an upcoming monthly billing statement. What is Comcast's approach to Excessive Use? Comcast has an excessive use program to provide a high-quality service for all of its customers. The company uses reasonable network management practices that are consistent with industry standards. Comcast maintains an Acceptable Use Policy ("AUP") located at http://www.comcast.net/terms/use/ for its Comcast High-Speed Internet Service customers. The AUP discloses what constitutes unaccpetable conduct and uses of the service. The AUP includes requirements regarding data usage that all Comcast customers and users of the service must follow. Comcast determines excessive usage in relation to typical residential uses of its service. The company does so in order to identify truly excessive use while not impacting the vast majority of Comcast customers - more than 99% - who use the service as intended. Does Comcast use a monthly data usage threshold to determine excessive use? Comcast will initiate a 250 GB monthly data usage threshold for all residential Comcast High-Speed Internet accounts. This threshold will be in place to provide a clear definition of what would constitute as excessive use of the service. The new monthly data usage threshold will go into effect starting October 1, 2008. Why is Comcast going to provide a monthly data usage threshold for its residential high-speed Internet users? Comcast has been evaluating a monthly data usage threshold for quite some time and it has heard from high-speed Internet customers who have asked that it provide a specific number for excessive use. By providing a specific monthly data usage threshold, Comcast hopes to provide more clarification to its customers about what would qualify as excessive use. When will the 250 GB monthly data usage threshold be put into effect? Comcast will initiate the 250 GB monthly data usage threshold starting October 1, 2008. What will happen if a customer exceeds 250 GB of data usage in a month? 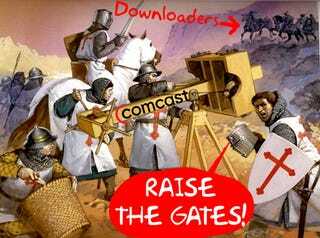 The vast majority - more than 99% - of Comcast customers will not be impacted by a 250 GB monthly bandwidth or data usage threshold. If a customer exceeds more than 250 GB and is one of the heaviest data users who consume the most data on our high-speed Internet service, he or she may receive a call from Comcast's Customer Security Assurance ("CSA") group to notify them of excessive use. At that time, Comcast will tell the customer exactly how much data per month he or she had used. If a customer surpasses 250 GB and is one of the top users of the service for a second time within a six-month timeframe, his or her service will be subject to termination for one year. After the one year period expires, the customer may resume service by subscribing to a service plan appropriate to his or her needs. Will all customers who exceed 250 GB of data usage in a month be identified as excessive users? Yes, Comcast is setting 250 GB as the residential data usage threshold for excessive use. Customers who exceed 250 GB and are among the top users of Comcast's high-speed Internet service may get contacted by Comcast about their excessive use.